Cupavci is a popular Balkan dessert. The square shaped Cupavci sponge cakes are filled with custard which are then dipped in chocolate. Topping off the Cupavci is a sprinkling of dried grated coconut. mmmm delicious ! The origin of the name - Cupavci - is from the Croatian word "cupavi" meaning hairy,fuzzy or furry, in reference to the appearance of the coconut shell. 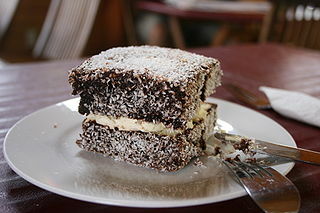 A very similar confection is the Australian dessert "Lamington" , named after Lord Lamington, who served as Governor of Queensland Australia from 1896 to 1901.